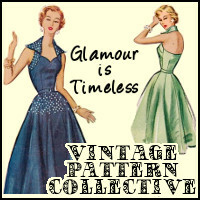 Exciting times today friends - we get to cut out our Dakotas...wooohooo! I cut mine out in size 40 in just under 2 metres of 150cm-wide fabric, using the cutting layout provided by Named. I'm usually all for conjuring up more economical layouts, but in this instance the one provided in the instructions worked a treat. 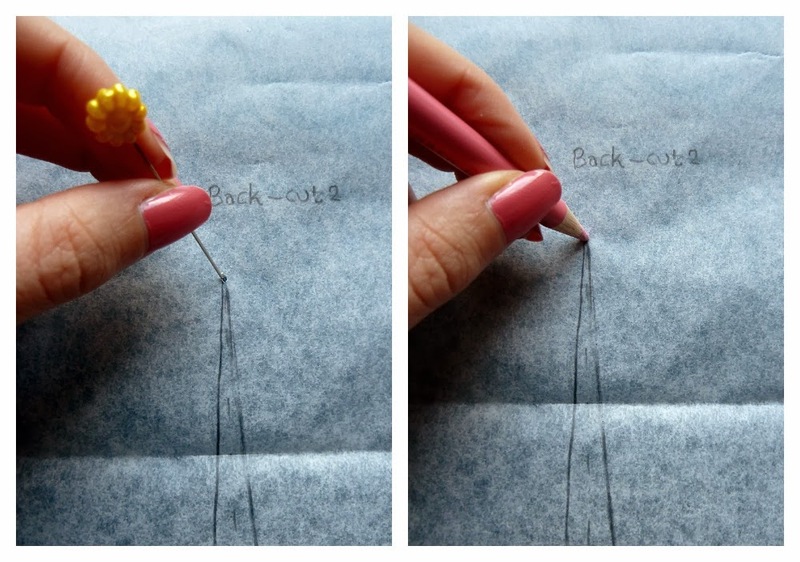 However, if you do need to get creative with your layout and you're new to sewing, there's one key thing you really need to be mindful of - the grainline. 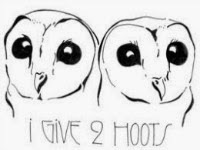 Because I can't explain it better, here's Sewaholic's words of wisdom on grainlines and a comprehensive guide from Threads Magazine on when you can ignore the grainline. 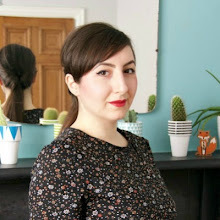 Because I also don't want to reinvent the wheel, I'm going to point you towards two excellent posts by Tilly and the Buttons - Before You Cut Your Fabric and Marking & Cutting Fabric. At this point, you'd be forgiven for wondering what on earth I was actually going to show you today?!? Well, I'm sharing an unorthodox time-saving tip for marking darts and other straight lines of course! I hope you don't judge me too harshly for cutting corners and that you find this useful instead! Use a pin or your marking tool (a chalk pencil in this case for me) to create a small hole in your pattern at the tip of your dart. 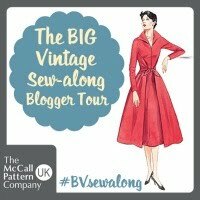 I feel particularly comfortable doing this with a pattern I've had to trace myself, but I'm not so sure I'd treat an expensive pattern in the same way! Through the hole you've just created, mark your fabric with a dot or a cross - it should be the wrong side of the fabric you're marking as you fold your fabric right sides together when cutting out pattern pieces. 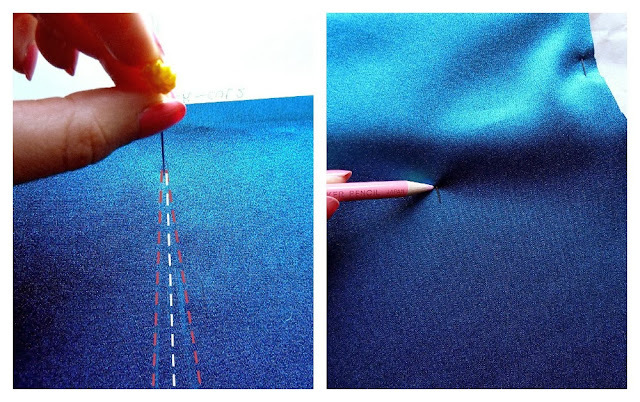 Now take your scissors and make a tiny snip at the start of each dart leg, making sure you snip both fabric layers. Also make a snip at the point indicating the centre of your dart - something I stupidly forgot to illustrate I'm afraid, but it's basically the start of the perforated line. Next, take your ruler and join the dot or cross marking the tip of your dart, to the snips you made. Voila, you now have a beautiful dart that took no time at all to mark! To mark the dart on the other side of your fabric, keep your two layers of fabric firmly pinned together and stick a pin through the tip of your existing dart. Flip the fabric over and mark that spot on the other side. Remove the pin and join the new dot or cross to the snips, just like you did earlier - this is why it's important to make sure that your snips go through both layers of fabric the first time round! 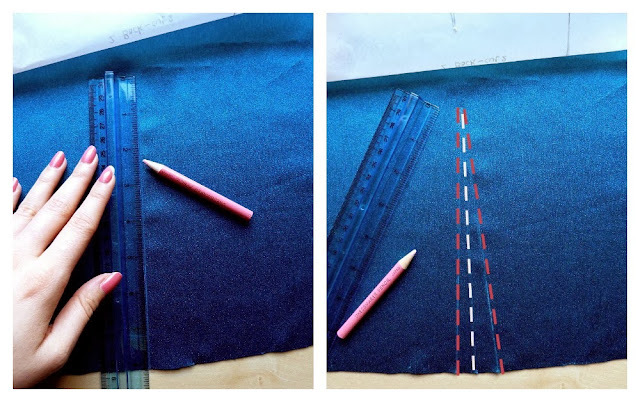 I used this exact same method to mark my pocket placement, only this time, remember to make the marks on the RIGHT side of your fabric - to do this, just pin your skirt pieces wrong sides together. I made a hole to mark the top and bottom corners of my pocket. I then snipped away as shown below. Finally, as with my darts I used a ruler to join the dots to the snips. And I followed the same method to mark the pocket on the other side. 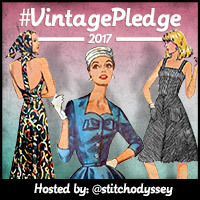 Are you a fan of the odd unorthodox stitching method, or do you like to stick to the rules? I think I take that lazy dart a small step further. To mark the dart point, I poke a flathead pin through the pattern and both cut layers placed wrong sides together, then pull off the pattern up (ripping a tiny hole). I also nip the dart legs (but not usually the center dashed line). I then lift up and stick a second pin in from the underside through the same holes. Then pull the pieces apart with pins in place. The head is on the right side of the fabric and the sharp end is completely pulled to the wrong side of the fabric. Then I immediately press the center crease of the dart. 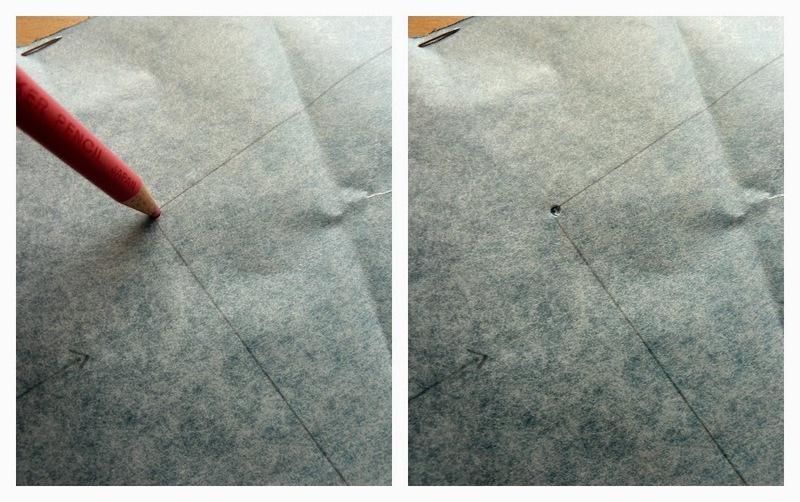 Hold the pin to mark the apex, and fold the two legs together by matching notches then carefully press a crease. I then immediately sew the dart. I find with a narrow dart like these I can easily sew a straight line from the snip to the apex (but it could be chalked, too). I use the pin as a bit of a handle as I'm sewing. It can be pulled out at the last minute if needed. I sew as close to the apex as possible, then lift the presser foot move back from the apex and sew locking stitches in the body of the dart. Then snip threads and press. It takes much longer to explain than to execute and results are great. Thanks, glad to help. Also an excellent pattern of course!